Mgr. Lucia Gregorova Stach, PhD., art historian and curator. She had studied art history at Trnava University in Trnava (Master´s degree in 2000), Charles University in Prague (Study Stay 1997-1998) and at the Academy of Fine Art and Design in Bratislava where she completed her PhD. in the Department of Theory and History of Art and Architecture in 2015. Between 2002 and 2006 she was working as an exhibition curator in the Jan Koniarek Gallery in Trnava. She curated a number of exhibitions since 2000. 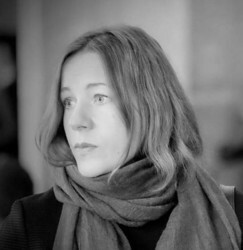 Since 2010 she has worked in the Slovak National Gallery as a curator of the modern and contemporary drawing collection and as an exhibition curator and editor. In June 2013, she has been appointed a chief-curator the Modern and Contemporary Art Collections at the Slovak National Gallery. She prepared several exhibitions and publications for the Slovak National Gallery, e.g. retrospective shows of Juraj Bartusz, Jana Želibská (2010 and 2012, with V. Bungerová), monographic exhibition of Stano Filko titled Poetry on Space – Cosmos in 2016 (with A. Hrabušický), international exhibition Maps. Art Cartography in the Centre of Europe 1965 – 2011 (2011, with D. Čarná), exhibition Diversity Required! (2014, with V. Kleinová) and cooperated in several curatorial projects Painting after Painting (2010), Blood (2012), Two Landscapes (2014). In 2015 she curated a solo exhibition of Stano Filko for Zacheta – National Gallery of Art in Warsaw (with J. Kordjak). She regularly takes part in the local and international symposiums and conferences and publishes texts in catalogues and art magazines. She is a member of AICA.